The Nest Learning Thermostat is the smartest way to control the temperature in your home, and for Black Friday, it’s on sale for $70 off. In the era of “smart home”, there may be no smarter innovation than the smart thermostat. Now, the Nest Learning Thermostat is on sale for the price of $179.99 at Walmart, which is a hefty discount from the thermostats normal price of $249.99. For those not in the know, the Nest Learning Thermostat, as the name suggests, actually learns from your thermostat habits to be able to program itself to always be at your ideal temperature. After just a week of usage, the Nest can run itself with no additional programming, and will also adapt to the changing of the seasons to ensure you’re always comfortable in your home. For the penny-pinchers, Nest also offers a full breakdown of the energy your heating and air are using, which can offer helpful insight into getting that pesky energy bill down. Although it may seem odd to invest in a high-tech thermostat, the Nest Learning Thermostat can help customers lower their energy bill, and stay at a state of comfort without ever having to worry about touching the thermostat. At the price Walmart is selling them now, they’re certainly worth the small investment. 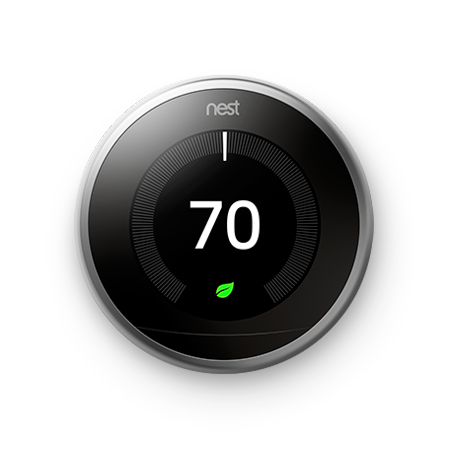 The Nest Learning Thermostat, on sale for $179.99, down from $249.99.